We got an Arduino Esplora for Xmas!! or more strictly a knock off copy. Official Esplora boards are way too expensive, but copies are starting to appear, and for about £20 you can get a board, with a TFT screen included. We wasted no time getting everything working with Sniff, and we'll post details in a future post (once we've released the drivers in the next code batch). 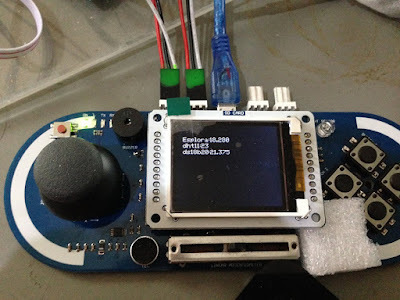 However its basically an Arduino Leonardo (use leo-sniff) with a bunch of sensors built into the board. While overall we're fairly positive about the board, when we started coding for the temperature sensor, we ran into some problems, which might be of interest to others using the board. The first thing we found was that readings were inconsistent and jumped around. A little research showed that this is a fundamental design problem with the Esplora. 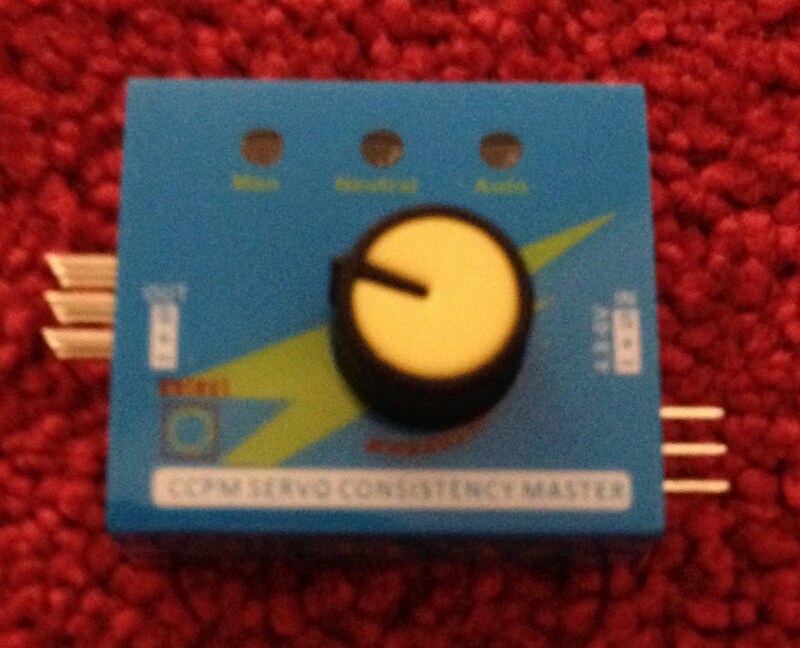 In other words the tmp36 is a solid, well thought out/built device that is well suited for many applications. However its inclusion in the Arduino isn't well thought out or well suited. which is exactly the equation you'll find inside the Esplora library. But here's the first real problem... What happens if we change A by 1? T changes by 500/1024 or about half a degree. The absolute best we could hope for is that the temperature is going to change in half degree steps. Now that would be OK in many cases - accurate to the nearest 1/2 degree over a range of -25 to 125 degrees is pretty impressive. The ds18b20 is a similar, or worse spec, and its great - I regularly drop it in coffee, or buckets of ice to see what happens. But the ds18b20 comes in a waterproof case on the end of a wire. The sensor on the Esplora is soldered to the board underneath the TFT screen. It's only going to measure air temperature in nice people friendly environments. Drop it in boiling water and you've got a bigger problem than half degree errors. Most of its life is going to between 20 and 25 degrees. Getting it wrong by 0.5 degrees is quite a lot when you'r only expecting a swing of 5 degrees anyway. Had the designers being paying attention to that graph on the Adafruit page they'd have noticed its got three lines on it, and the other two which represent the tmp34 and tmp35 are much steeper. In other words they give a bigger voltage swing for a given temperature change.With the tmp36, even in extremely hot or cold rooms we're never going to see more than a 0.1V swing, which the AVR ADC just isn't sensitive enough to measure well. They picked the wrong component for the job. So wrote a demo app, averaging the temperature, which was reading a consistent 23 degrees and displaying it on the screen. Then I moved it to run from a USB PSU, rather than from the computer and the temperature reading dropped 5.5 degrees. Moving it back to the computer and it was high again. Moving it from the USB hub to being directly plugged in dropped it 5 degrees. We simplified this using Vcc=5, because USB runs at 5V... except it doesn't. USB specifies a voltage between 4.75 and 5.25. There's always a margin of error, and its considered OK to have a value +-5%. That corresponds to a 5% swing in T+50, or about +- 4 degrees at room temperature. Using a USB Voltage/Current meter I was able to measure my power sources, and found that my USB hub is borderline out of spec, giving a low voltage, and hence high temperature. Both the Mac port, and the USB battery are pretty close to being right on spec, but even the difference of 0.04V was enough to give a small change (after averaging). Unless you trust your power supply totally the sensor is accurate to with 4 degrees. Again that would be fine if we were measuring a range of temperatures, but as we're limited to measuring air temperature 4 degrees either way of a 22 degree reading is not knowing if its 18 degrees (put a jumper on) or 26 degrees (open a window). At one point I was plotting the temperature on the screen and got a regular up/down cycle. It turned out my USB volt meter was dropping the voltage by a few mV every time it switched from volts to amps reading... enough to give a systematic temperature variation. For reference I hooked up a dht11, and a ds18b20 to the tinker kit ports of the Esplora, and set it to display all three recorded temperatures. The DHT11 and ds18b20 produced different readings but they were consistent when I changed the power source. The DHT11 is known for being inaccurate, but if it constantly reads high (as mine seems to) then you can calibrate around it. Now you might argue that its just a fun/toy beginners board and that it was built to a budget, but that doesn't hold water. For a start the official boards sell in kits for £70. Also while its pretty easy for me as an experienced engineer to deal with these issues, someone less experienced would just be sat with a gadget that didn't work reliably. Perhaps the worst thing though is that there are other solutions out there that would do the job better and more cheaply. A tmp36 costs about £1 on eBay (pennies in bulk), but a thermistor costs pennies on eBay (decimal points in bulk). They provide similar accuracy but because you thermistors as a potential divider Vin is proportional to Vcc, which means that in the equations Vcc just cancels out. The real ironic moment is when you realise they picked a component: the tmp36 that has as a design feature that Vout is independent to Vcc. The tmp36 behaves the same even if the voltage changes... which in this case directly leads to us getting the wrong results. It's not the tmp36's fault... They just picked the wrong component! 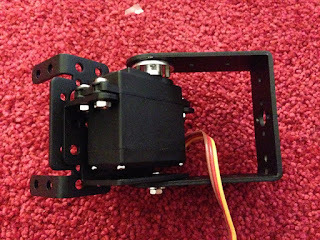 The better servo's you can afford the better your arm will perform but as we need 6, and good quality servos can be expensive I chose to use MG996R's. I was able to get the six for under £20, and they have the distinction of using metal gearing. 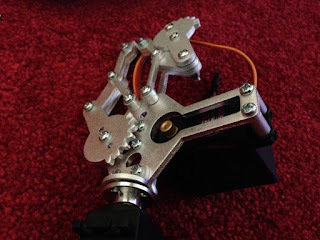 Most cheap servo's use plastic gears which aren't up to the task of moving a pretty heavy arm. If you feeling like experimenting you could use faster/plastic servos for the end of the arm (where strength is less important), and pay more for bigger/stronger servos at the base (where you need the strength), but to keep things simple I just ordered a batch of the single type. 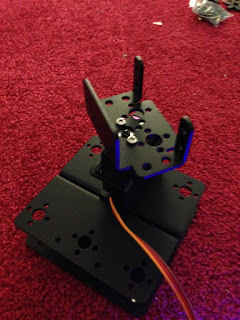 The other extra compont I ordered was a set of metal servo horns. 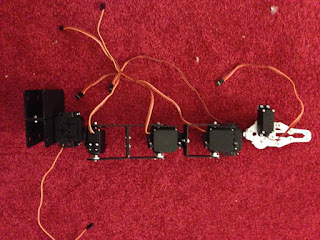 Servos come with a bunch of different shaped bits of plastic you can use to attach them to your hardware, but again we need something that's a bit stronger than usual. I read a post which recommended using these circular ones, and totally recommend the extra few pounds spent, rather than risk your build on some bits of plastic. 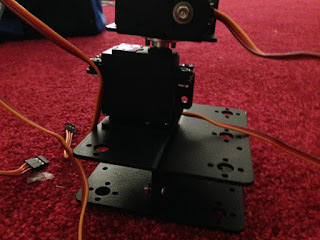 The other extra item you might not have that's going to really help this build along is a servo tester. 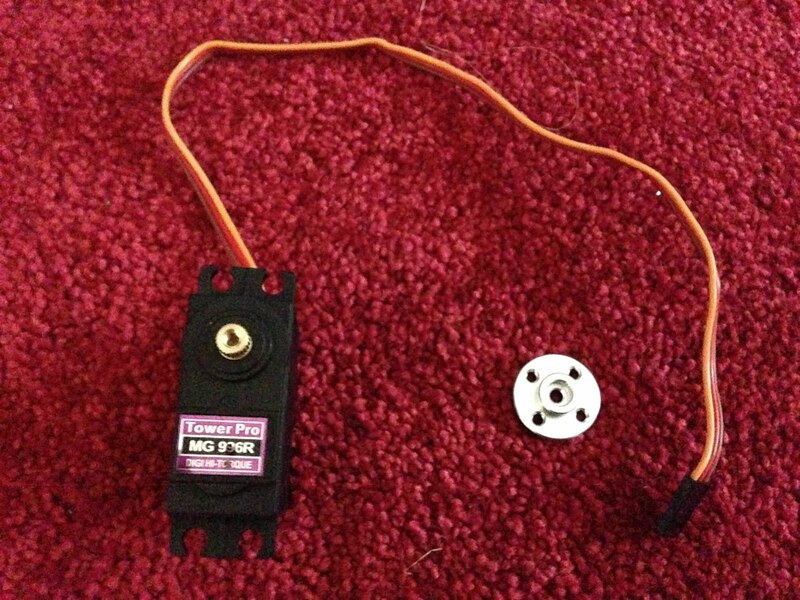 These cost about £3 on eBay, and you just plug a battery in one side, and a servo in the other. Then turn the dial to move the servo, and check its range of motion. It also has a mode to move the servo to its centre position which is really handy when you're putting all this together. 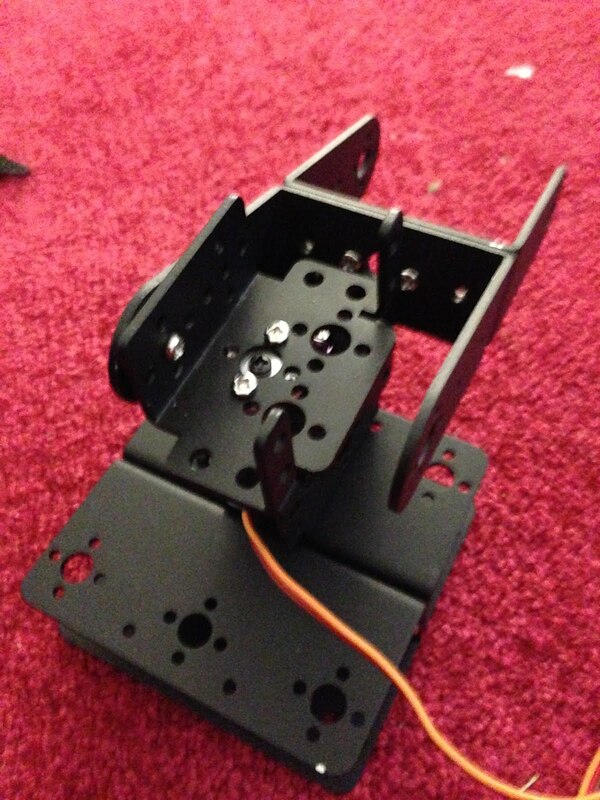 I started by putting together the gripper. This is pretty easy, but there are couple of easy mistakes you can make - if you do it in the wrong order you'll not be able to fasten all of the screws. Attach the horn to the wrist servo first, then attach it to the gripper. Then mount the servo on the gripper, and attach the servo horn to the gripper. You should have something that looks like the above. 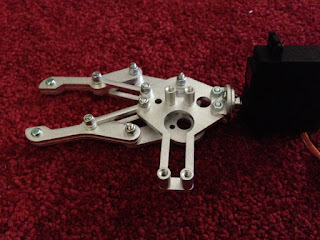 Finally attach the servo horn to the servo: use the servo tester to move the servo fully counter-clockwise, then move the horn into place so that the jaws are closed. You can then test that the servo movement correctly opens and closes the arm before attaching the horn to the servo permanently. With this done you can now have some fun using the servo tester to control the gripper and pick things up. It's remarkably strong! 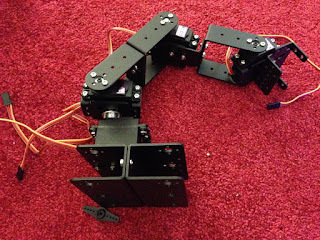 With the gripper completed we can work back down the arm. 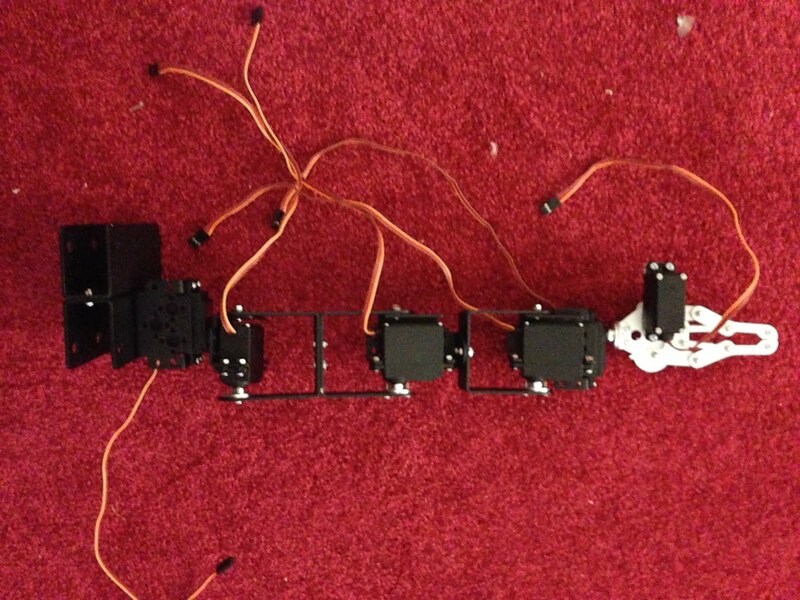 The above picture shows the beginnings of the joint assembly thats used for the three main joints on the arm. 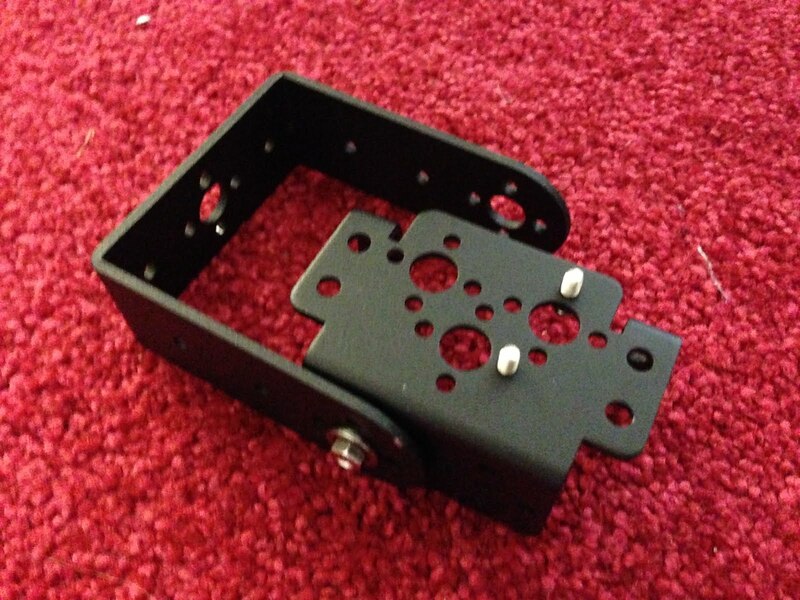 It consists of a U-bar and a servo bracket. What's less obvious is that they're bolted together with a bearing between them. Somewhere in the packaging you'll find what look like three fat washers, but infact they're bearings which are going to allow the joints to move smoothly.The bearing goes into the U-bar (from the outside) and then you can put a machine screw through from the inside (so the nut goes on the outside), The two pieces are secured together now but can still move freely. 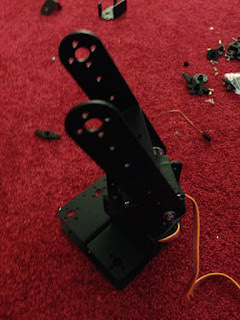 You'll notice that there are a couple of short screws poking out from the servo bracket. You can use these to bolt on another bracket, which we'll put the write servo in. Make sure you use short screws as if they're too long you'll not get the servo to lie flat. Use the servo tester again to make sure that the range of travel is appropriate. 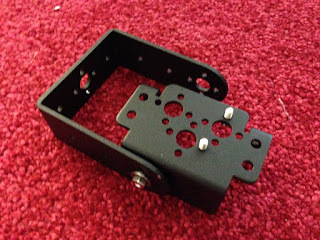 Finally you can bolt the servo to the bracket, using the rubber grommets that probably came with your servo to keep everything nice and snug. Here I've put the wrist servo and gripper into place to get an idea for what it will look like and check the range of movement again, but as the gripper and two servos are quite heavy, we'll leave final assembly till the end. The base its quite easy to get started with. There are two larger "flat' u shapes that bolt together to make a platform. Then we bolt a servo bracket to this. 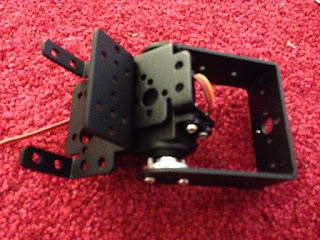 A servo goes into the bracket, and then we add attach a second bracket to the servo horn so that we can spin this around. Now we just need to make the final join that connects the top to the base. 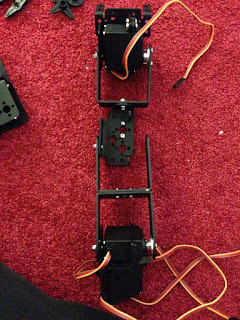 In this picture you can see the H we've just made, and a servo bracket attached to the top left arm (with a bearing again). The one piece left is an L shape which is attached to the back of the servo bracket and the botton of the other U-bar. Here's a close up of the final joint, and the whole arm from the side, which gives a good idea of how everything goes together. 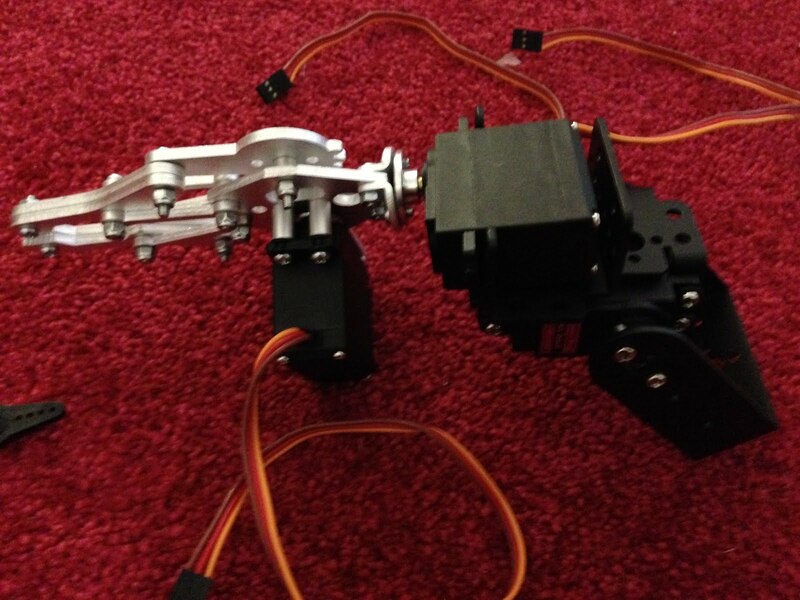 All that's left is to bolt the wrist servo into its bracket and you've got a robot arm!!! Use the servo tester to run all the parts through their range of motion. 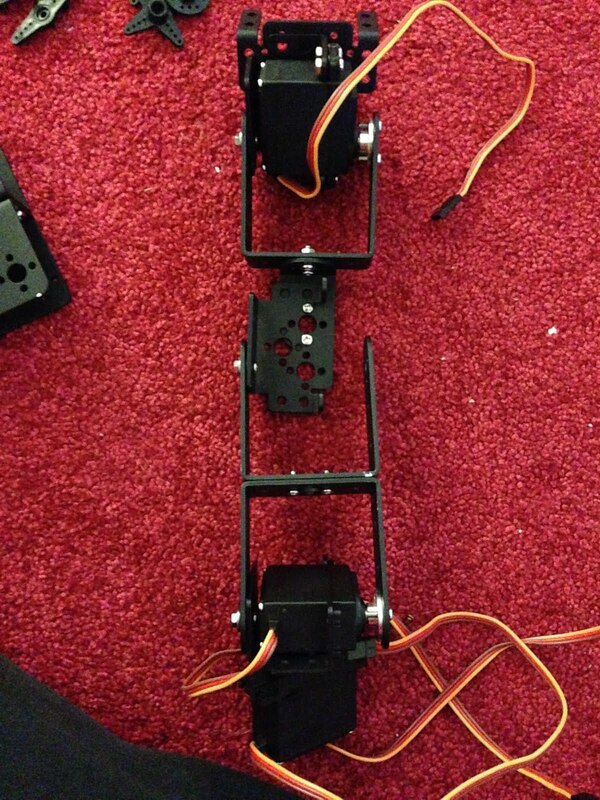 Hopefully you checked each joint as you built it to make sure that the servo was correctly centred. If it not quite right then you can try and make some adjustments now, but its tricky. You'll find that un-powered the arm isn't strong enough to support its own weight, and it will keep collapsing. However powering up each joint will show that in fact its going to be pretty powerful. I guess you could use 6 servo testers(!!) to control the thing, but tomorrow I'll hook this thing up to an Arduino and we can start driving it properly! This little snippet of code will drive a servo on a digital output pretty well. Just set "x" to be from 0 to 1 and the servo moves. That's great if you're running one or two servos from an Arduino, but if you're running lots then the timing will probably start to drift, and you'll use a lot of CPU driving outputs when you could be doing more useful work. If you're on a Pi, then the timings will be a mess to start with, and you might want to be cautious of driving 5V servos from a 3.3v Pi. You should also be worried about output currents from the Pi. Finally you're using up output pins that you might need for something else. 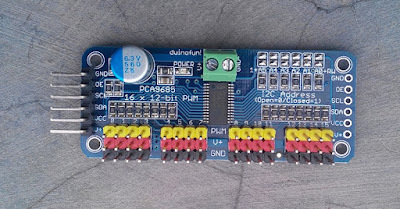 The PCA9685 takes care of all of this: it uses i2c (only two wires), and drive 16 outputs with accurate timings. 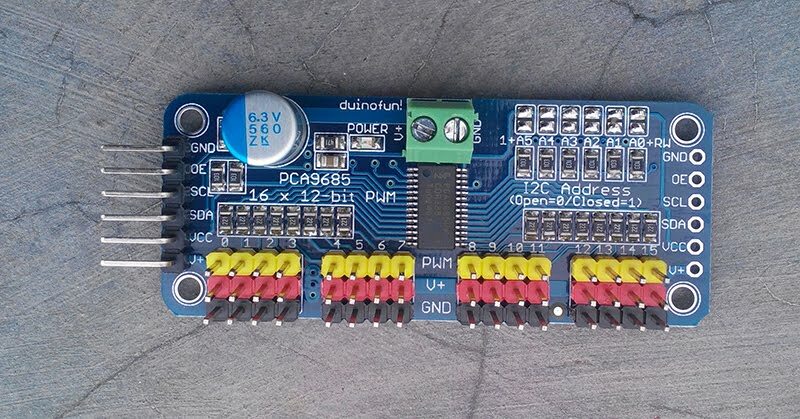 Breakout boards can typically drive an output output with a moderate amount of power, and you can run the outputs at a higher voltage than the control pins. ...tell pca9685 to "set brightness"
Here the LED's are plugged into the first 8 channels of the board, which are numbered 0-7. Just set the channel, and a value between 0 and 1, then tell the pca968 to send that to the hardware. Here Ive set up a sine wave with an offset so we get a nice ripple effect. ...tell pca9685 to "set servo position"
Doing this with Servo's is just as easy. However the value goes from -1 to +1 and we use the command "set servo position". That's because servo's have some pretty specific timing requirements, so "set servo position" handles all that for you. 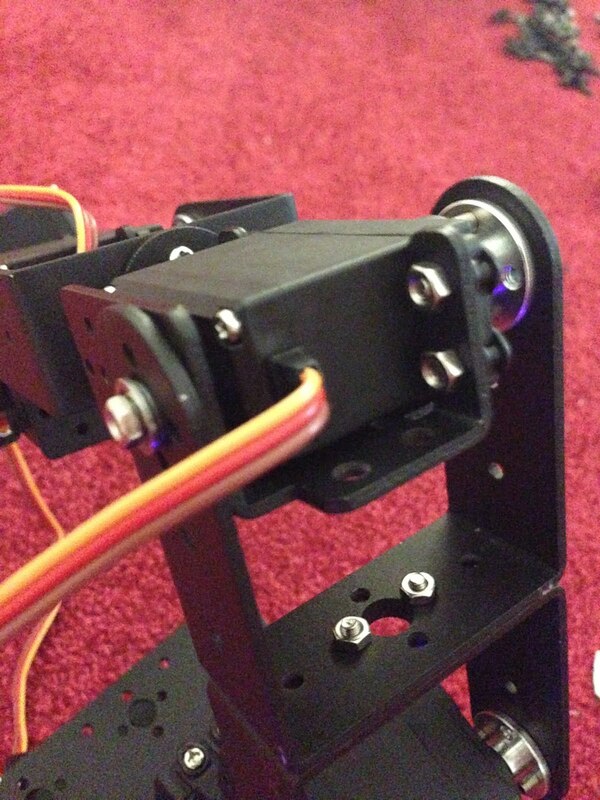 Depending on your servos you might find that -1 to +1 doesn't give the full range of movement, in which case try increasing the range gradually. A lot of servos need a slightly larger range, but too wide a range of values can damage the servo. The -1 to +1 range is configured to be safe for most hardware, and follows the "standard" behaviour, but try experimenting. 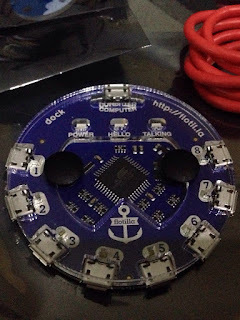 I recently posted that my Flotilla Medium starter kit had arrived, and I documented the low level code that you might find useful if you were going to write your own code to talk directly to the hardware. 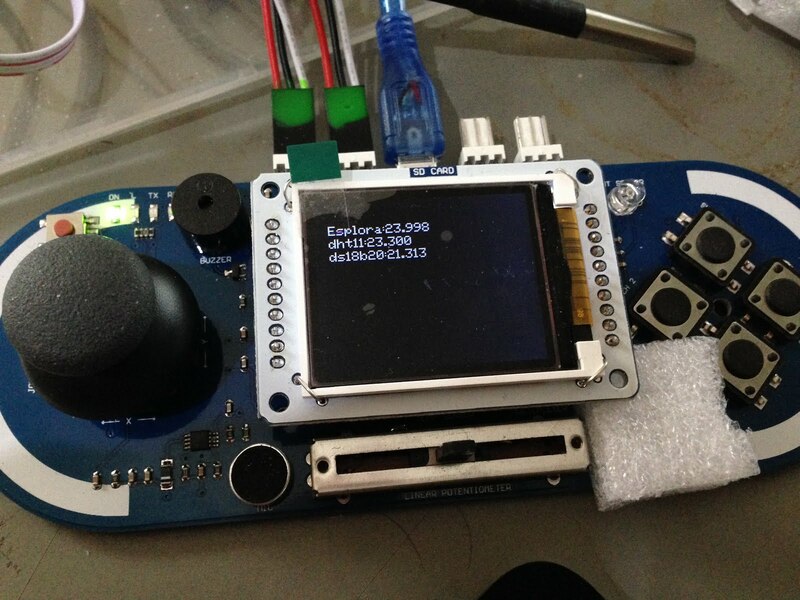 You could actually to that yourself entirely in Sniff using the serialPort device, but the plan was always to add Sniff devices to support the Flotilla. or whatever port you have it on in the shell after you've run setup. The first thing you need to do is make a flotilla device. This represents a the flotilla dock and much like the dock you don't actually need to do much with it. It just acts as a hub for all the other devices you might want to use. Once you've got a dock you can make an actual module and do something with it. Here I've attached a light module, by making a flotillaLight device and calling it light. The Flotilla has 8 ports, but you can plug the module into any of them - Sniff will look for a light sensor and use whichever port it finds it on. However if there isn't one plugged in then it will give and stop your program. This has the advantage that if you've not plugged it in yet you'll get a warning message but your program will keep running, and you can plug the device into port 4 later. In future you'll also need to use this if you want to plug in multiple devices of the same type (the mega-treasure chest includes two light modules and two motors). At the moment you can only attach one of each type of module, but that'll be fixed before the full release. To read or write a sensor, just tell it to "update". You can also tell the dock to update, which you might want to do if you're not updating any other sensors for a long time just to give it a chance to do any housekeeping work, but this generally shouldn't be necessary. In the case of the Light sensor "update" sets the variable brightness and we just print it out. Weather works in the same way, setting temperature and pressure. Touch sets the four variables to be true of false depending on if the button is pressed. Rainbow is the most complex module in the Medium kit, and works just like the neoPixel device, except that we change the names. rainbowShade is the brightness (between 0 and 100), while rainbowColor is the hue between 0 and 360. We make a rainbow and a weather device, then fill the rainbowColor list with 0's representing red. Then we read the temperature, and fill in rainbowShade. Using counter, we calculate a value for each LED from 22 to 30 degrees. If the actually temperature is greater than that we turn the LED on (red). If its less than that we turn it off. The result is a thermometer that displays temperatures from 20-30 degrees in 2 degree steps. This is a handy range as its easy to see the display change just by holding the sensor. Finally I wanted to do something with Touch, so I build a game of "Simon". The computer flashes the Rainbow LED's in a sequence which gets longer each turn, and you have to copy the patten on the keypad. To play the pattern we simply loop over the list turning on the required LED of a short period with a smaller time gap between each. To actually play the game we add a random led to the pattern so far then play it back. Now we need to check the the touch pad. We go through the pattern one step at a time and wait for a key to be pressed. We record the key press then wait for the key to be released.... This is important otherwise just touching one key would be recorded multiple times. Then we check that the key pressed was the right one. If it wasn't we run a script called flash to indicate failure, and end the came. If we get to the end of the pattern then we go background, add another light to the sequence and keep going! You'll not that when I'm checking the buttons I'm not calling update. I need to keep calling it, otherwise the variables representing the keys will never change, but it would make the code messy, so instead I've got a separate script which just keeps calling update. (it also randomises the game by throwing away random numbers - I've talked enough about that in other posts). That just leaves flash which is pretty obvious. Where the HW has real potential is for expansion. The design allows new modules to be added. There are currently 12 available, but I'm surprised the so called "pirates" at Pimoroni forgot to include a compass. A 16x2 LCD text screen would also be simple to add. Right now its a nice piece of fun, but wth an ever expanding range of modules at good prices, then this could be a really great piece of kit. It's finally here! Way back at the beginning of the year Pimoroni announced a project on kickstarter to make it childproof to plug sensors into a Raspberry Pi. While we love Arduino, the Flotilla gave the chance to do similar kinds of physical computing with a much younger age group. While Sniff is possibly a bit advanced for the Flotilla's core audience, children grow up... and taking cool hardware that was bought for one age group and letting them reuse it with Sniff when they're a bit older not only makes the equipment costs more manageable, but also lets kids focus on what they're doing in software without getting scared of new hardware. Finally (a little late, but just in time for Christmas!) it arrived. Now the normal thing to do (and what I would normally do with new hardware) is follow the instructions to check its all working right, before pulling it apart to see how it works. However in this case I decided to jump right in, and see what makes it tick straight away. One of the reasons for that is that Flotilla is designed to work with Raspberry Pi. I understand Pimoroni's justification for that (marketing and support issues), but Flotilla is totally wasted on Pi. It's USB so plugs into a regular computer and works just fine, and the idea of having a simple USB breakout for hardware boards is that you don't need stuff like GPIO, so you're much better off sticking with your regular computer. First thing is we get a serial port,so lets fire up a serial monitor and see what happens. You need to set your serial port to 9600baud, and send <CR> carriage returns - NOT LF/Linefeeds, or CR/LF. Then you're in business. # Flotilla ready to set sail..
You can get this in a slightly more human friendly, but less computer friendly debug message by typic "d". One minor quirk is that the channel numbers are numbered 0-7 in the opposite direction to the numbers on the board which go from 1-8. That means that "weather" on channel 2, is actually plugged into the socket numbered 6 (8-2=6). Probably best handle that in the low level software somewhere. Here the temperature is 21.8 degrees and the air pressure is 1010. Light sends three values, but looking at the Python code, the first value is the brightness. Most of the input devices should be pretty obvious. Rainbow is the only output device I have (I got the medium kit ), and they're a but more tricky. The Rainbow is on channel/port 4, and we need to send it 5 rgb triples. 255 is full brightness. 0 is off.